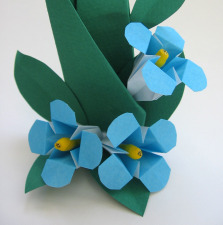 This easy origami flower is our adaptation of one in Origami by Toyoaki Kawai. It's a perfect model for a beginning folder and fun for everyone. To have it resemble a dainty spring Forget-Me-Not, we used light blue paper and added a yellow pistil with a dot of gold glitter glue. Of course, you can make it any size or color you like. Below are the materials we used for the display below. 1 sheet of perfectly square paper, 3x3 inches. We cut a standard 6-inch piece of origami paper into quarters. One ear swab per flower. One 8½x11-inch piece of dark green textured art paper, or construction paper. Tip: The paint we used for the flower centers required drying overnight. If you want to make the flower centers first, skip to Step 13. The leaf instructions begin at Step 16. 1. Begin with a square base (preliminary fold). Important: Begin folding with the colored side up. 2. Lift one of the triangular flaps on the existing center crease. 3. Open the flap and squash-fold into a triangle. Tips: Run your finger up into the point as far as you can. Then, on the outside, align the crease line with the center line. While holding this, slide your thumb toward the point at the top. ...until you end up with a kite shape. 5. Page-turn one of the top flaps so that you have a solid white "kite." 6. Fold in the two side points to meet in the middle. Notice how the edge of the paper forms a straight line across the model, as indicated by the arrow. 7. Repeat the last two steps three more times until you have this. 8. Lift the top layer and press flat, forming the first petal. 9. Repeat with the other three petals, turning the model and flaps as necessary. 10. Hold the flower and lift each petal. You might like the flower like this with pointy petals, or cut them round as described next. 11. Collapse the flower with the petals extended, and round the tip with sissors, cutting away as little as possible. Be careful not to cut into the little colored triangles. 12. Refold the petals and you have the finished origami flower. 13. To make the yellow centers (pistils), put some paint in a cup and dip the swab ends. The paint we used required drying overnight. 14. When dry, cut the pistil to length. 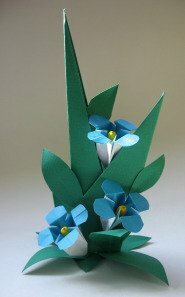 If you made your flower from a 3x3-inch piece of paper, cut it 1 3/8 inches. 15. Glue the pistil to the flower. Find something that will hold the flower upright while the glue dries. To finish the forget-me-nots, put a dot of gold glitter glue on the center of each pistil. 16. 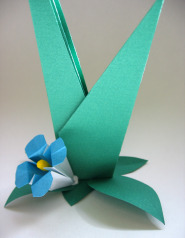 To make the leafy part of the origami flower display, first make a tulip leaf. 17. To make the small leaves, fold a scrap of paper in half before cutting. If you used a thicker paper, you can curl them by running your finger along the center line on the back side of the leaf. 18. 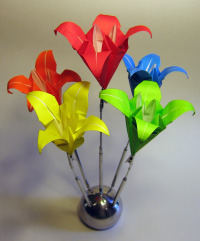 If you cut off the side flaps as described in the tulip leaf instructions, you will have a triangular scrap of paper from which to make a three-leaf base. Glue two leaves to the base. 19. Glue the tulip leaf to the base. Allow to dry. Continue adding additional flowers and leaves. 20. Curl the leaves at the base to make it stand securely without tipping over.